These cyclists are known as 'bicigrinos' which comes from the Spanish words 'bici' meaning bike and 'peregrino' meaning pilgrim. In order for a bicigrino to receive a Camino Certificate, they must journey at least the last 200km of any Camino route and finish up in Santiago de Compostela. One of the best routes to take as bike pilgrim is the French Way. To get your Compostela as a bicigrino on this route, you must at least start in the beautiful town of Ponferreda, home to the Templar's Castle. From here, it will take 7 days to reach historic Santiago de Compostela. 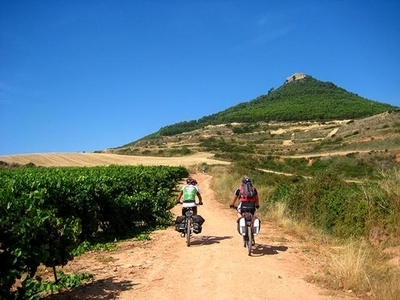 The first few days of this cycling Camino are made up of shorter cycling days across the beautiful mountains of El Bierzo where cyclists will encounter stunning views and lush landscapes. Next, the route takes cyclists to the pretty town of O Cebreiro where they will discover quaint stone houses called pallozas and a beautiful pre-Romanesque church. From here, the journey continues to Santiago via the rolling hills of Galicia, with its charming hamlets and villages. These towns and villages are the perfect place to exchange stories with fellow pilgrims and really experience the true spirit of the Camino. Although cycling the Camino is a journey within most people's physical capability, CaminoWays.com recommends that you only undertake the journey if you are familiar with basic bike maintenance and if you are used to cycling. Cycling from Ponferrada to Santiago de Compostela, covering 200km of the famous French Way route of the Camino de Santiago. 7-night holiday. Cycle between 23km and 50km per day. When and price: Available all year. Prices start at €739pps in high season (April to October). Includes: Half-board accommodation, luggage transfer from hotel to hotel, holiday pack with route maps. Optional: Bike rental, hotel upgrades. Does not include: Flights, insurance, bike rental. For other Camino routes suitable for cyclists or, to tailor-make your Camino by bike, visit caminoways.com.